Wolf, HalT and all who follow. Still no rain here Sheila. The rain you had went north of us yesterday. In fact there were tornado warnings in Ottawa yesterday. No precipitation in the forecast for the next 5 days. The concern now is for our well. 2:00 It snowed lightly when I visited there a number of years ago. Everybody!! Fortunately, the fires are staying to the north of us. Was scary enough last year when they came within a mile of us. No response to my e-mail to Greg. Has anyone else tried to contact him? BTW ... I DETEST female/male-bashing jokes ... but to any of us here who have been driven by raging female hormones ... that joke is hilarious! That would take an enormous amount of wind blowing and bough breakage to make that Cradle fall. Thanks, Joyce. And BTW This Easy puzzle solves easily without needing to enter possibilities or backtrack if you solve 6-&GT; 9 then 1-&GT; 5. I'm sorry Skye is having such a hard time, Plum. And, sorry you are, too. Tell her someone in Maryland is wishing her well. Morning all,another of Wendy's great photos. What do you do when you can't sleep and your mind is asking,why did this happen. Watch golf and do sudoku, I've been up since 3:30. Oh, Amelia. Please accept a hug. Thanks for coming here. You don't need to grieve alone. Thanks, Kathy. I will tell her when she wakes up. She's done a kitty cat thing and fallen asleep snuggled next to me on the couch. I will need to wake her soon for a dose of ibuprofen (thank goodness she is healed enough to be able to take it now as it is a better pain reliever than either Percocet or plain Tylenol and an anti-inflammatory in place of the steroids). Oh Plum, I'm sorry about Skye. But you know, when it was time for my baby bro to get his tonsils out, he was warned by my lil bro about behaving himself during the healing. After lil bro's tonsillectomy, his area bled and he had to go back to the hospital where he got shots of vitamin K. He told baby bro about the sticking in the rear part so baby bro was unusually quiet and well behaved!!! Beautiful big mountain, but it ain't no cradle. 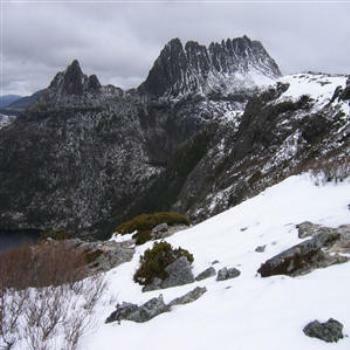 Cradle Mountain is one of Tasmania's better known landmarks. I looked it up and found some beautiful pictures of the mountain with Dove? St Clair? lake in the foreground. The term 'cradle' doesn't apply solely to infant's beds. It is also used to describe mechanical devices intended to hold things together, such as in a sling. Those familiar with such use would easily recognise Cradle Mountain upon seeing its shape, without the aid of a map. Thank you ,Plum. I have been doing the puzzle, just couldn't write anything without crying.